What if you woke up in a hotel room in a big city, only to discover you’re the only one in the entire city? Besides pulling down your pants and running out into the street screaming, you’re probably go looking for somebody to explain WTF. No, this isn’t a Twilight Zone episode, though it plays out like one. 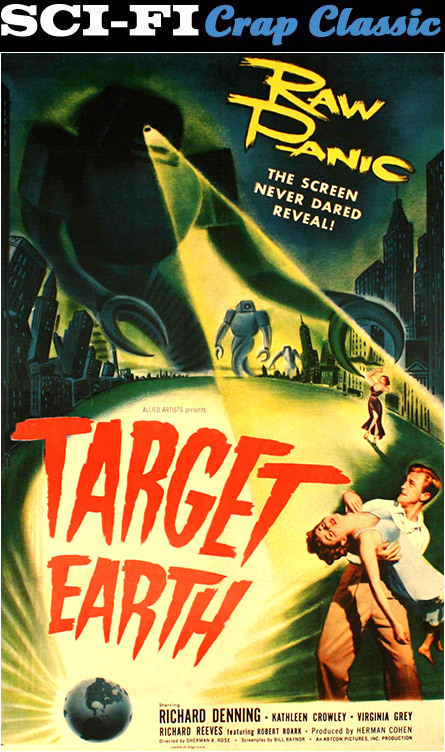 Rather, it’s the plot for Target Earth, an obscure sci-fi movie from 1954, which predated TZ by five years. So Nora King, having just woken up from a flubbed suicide attempt (she tried sticking her head in a toaster – just kidding), discovers all of Chicago is bereft of tax-paying citizens. Wandering around and starting to completely lose her beans, she eventually happens across a guy with impeccably combed hair just coming to after being smacked unconscious by criminals. Aha – an excuse is established! They go wandering and hear a piano being played in a cocktail lounge of all things. It’s here they meet a guy and his gal, both getting drunk as skunks because hey, free booze! Through the haze of sweet alcohol, they tell Nora and her crime statistic guy that the town had been evacuated because of a mysterious invading force, but that they were unable (too drunk) to go with the rest of the group. Now there are four and… What the flap – they find another person. Now the town is starting to feel crowded. 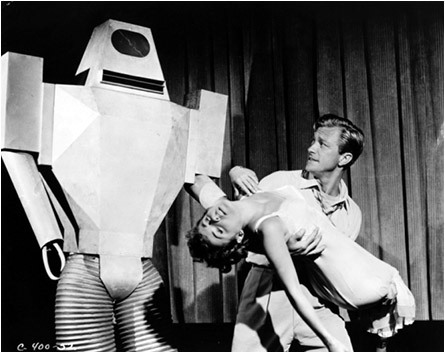 They find a newspaper with a headline warning of impending disaster, so new guy is freaks out and tries to start a car when he gets mad zapped by…an alien robot from Venus! That’ll teach him to try and jack a vehicle. The group heads into a hotel, finds rooms and try to figure out their next maneuver. If they were of sound mind and body, they’d pry open the mini bar. Before everyone figure out a plan, a criminal shows up with a gun and holds everyone hostage. Um, I think they were doing that to themselves. Bullets fly and then there were three. 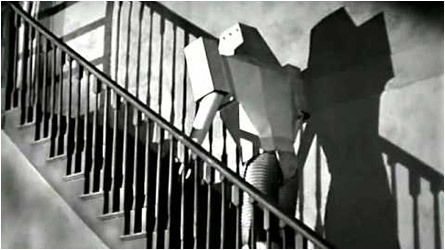 But an alien robot, scouting for loose citizens to eye fry, hears the gunfire and crashes into the hotel, eventually clanking its way up the stairs to the room where all the action is. 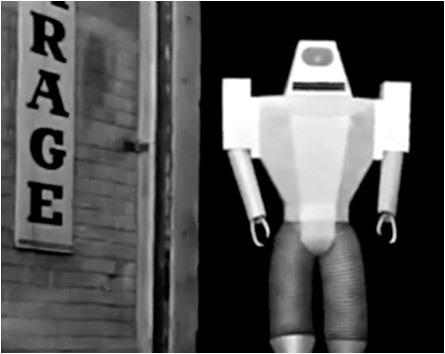 Heading to the roof, the robot is in slow pursuit. 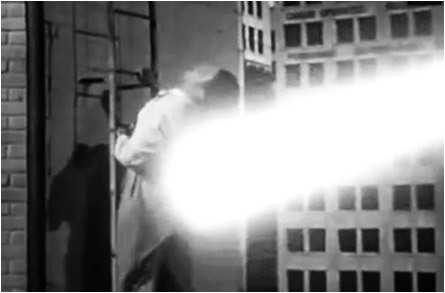 The drunk guy sacrifices himself to save Nora and her bullet perforated boyfriend and is vaporized by some sort of science beam. Before you can say “they’re f’d in the b-hole), the Army shows up, and using a loud speaker broadcasting a disrupt-o signal, disable the robot before it can shine a light on the situation. 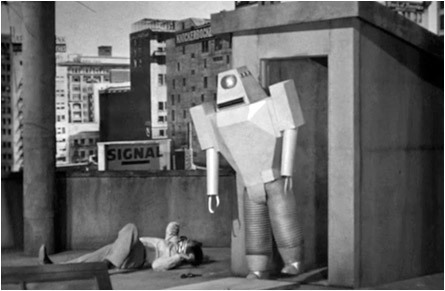 You never get to see the alien robot army, just the one tin can. The introduction of the criminal with a gun didn’t make sense. Not staying in the cocktail lounge didn’t make sense either because hey, free booze! And when the “army” shows up, there’s only a couple of jeeps. And too much time is spent talking and not screaming. Target Earth needed to find a bulls-eye. 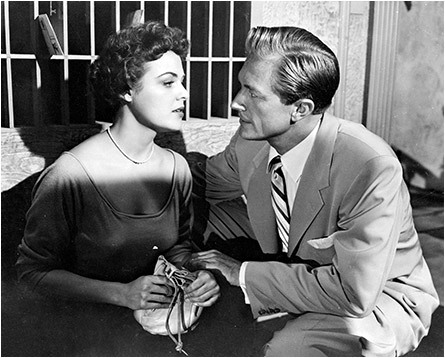 This entry was posted on January 29, 2016 at 7:42 pm and is filed under Aliens, Classic Horror, Science Fiction, Scream Queens, TV Vixens with tags alien robot, Aliens, Army, Chicago, Classic Horror, criminals, Nora King, Science Fiction, Scream Queens, suicide, Target Earth, TV Vixens, Twilight Zone, Venus. You can follow any responses to this entry through the RSS 2.0 feed. You can skip to the end and leave a response. Pinging is currently not allowed.